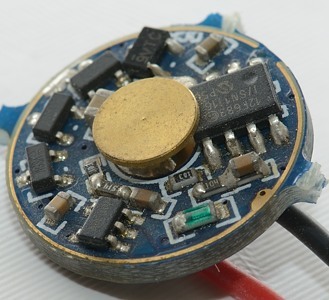 Note: This driver exist in a 5 mode (This review) and a version with two groups with 2 modes and 4 modes, please check description at IO for actual version when ordering. 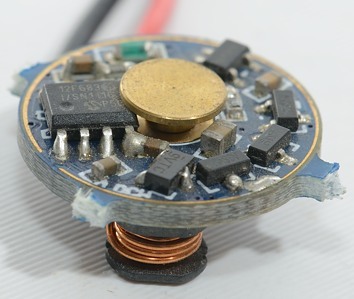 You can change between the set of modes by turning on the flashlight on low mode for about 3 seconds, the light will flash once, then quickly turn off the flashlight and then turn it on. A short off/on will select next mode, I did not find more than one mode set. 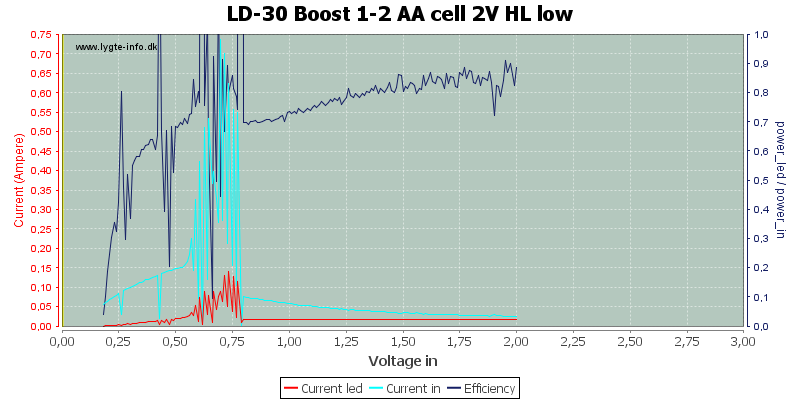 2V is test for single cell (Scope traces are done at 1.2 volt). 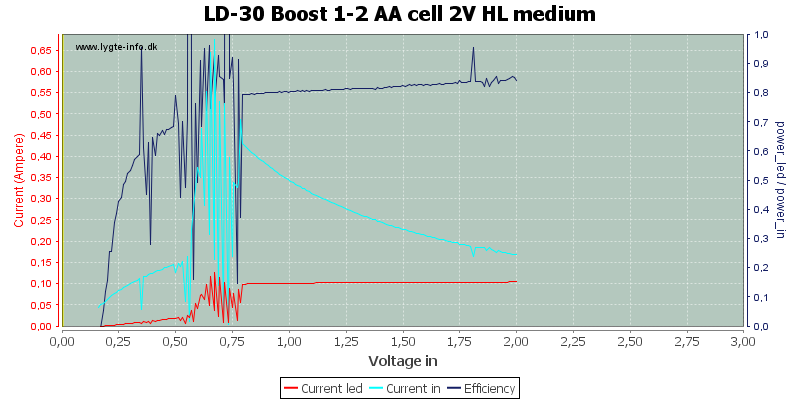 3V is test for two cells (Scope traces are done at 2.4 volt). 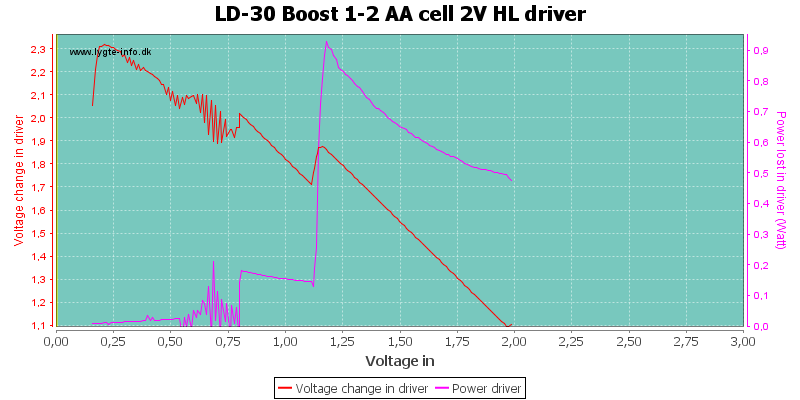 This driver is boost only, this means that the maximum battery voltage must be lower then the led Vf. 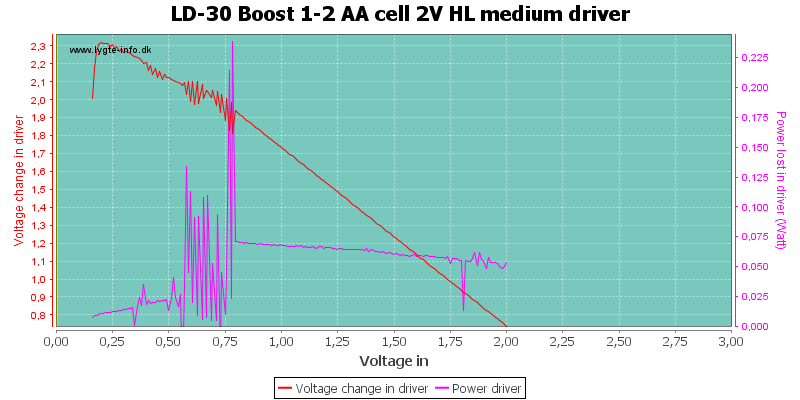 The rating of the driver says 3 volt and I stayed with that. 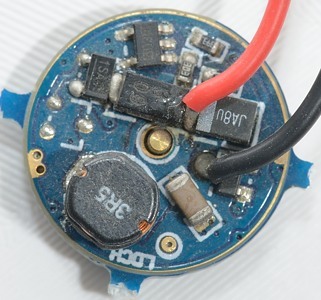 The output drops when the voltage is about 2 volt and at 1.8 volt the output starts flashing. 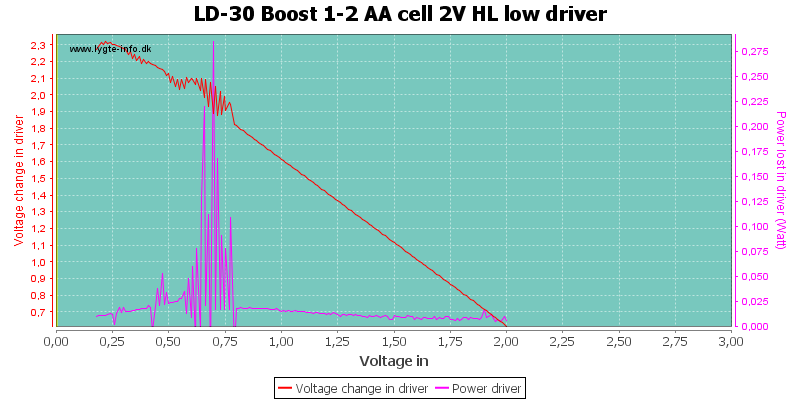 This is way to high for a single battery, but the driver is smart (see below). 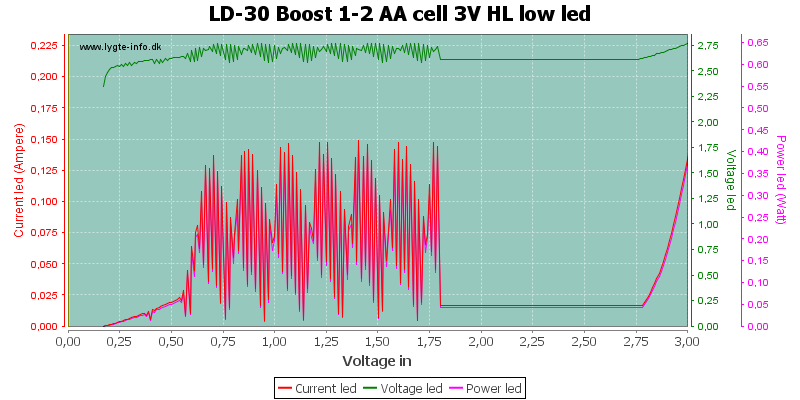 Note: The efficiency calculations are not correct when the driver is flashing (Current and voltage are not measured at exactly the same time). 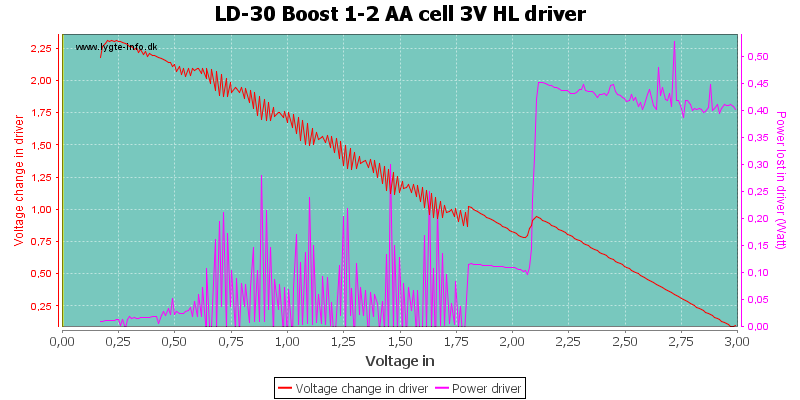 When starting at 2 volt instead of 3 volt, the driver assumes single cell operation and the battery warning changes to a lower voltage. Starting from a low voltage and slowly increasing voltage does not work. The driver starts at about 1 volt and will immediatly go into low battery warning. This warning will not disapper, even when voltage increases. 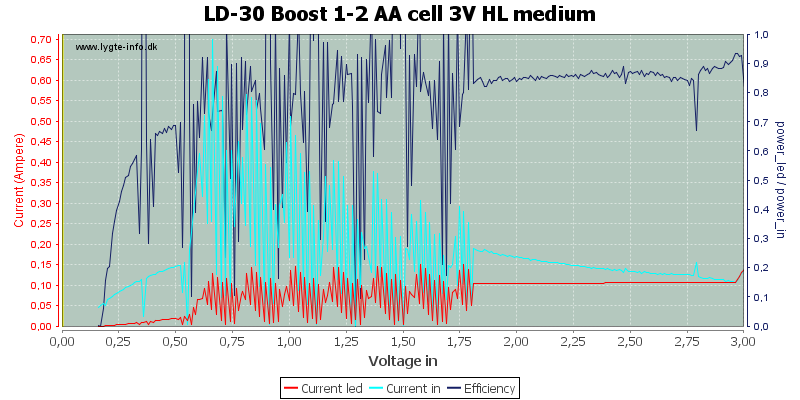 When driving the output at full current, there is some high frequency (>20kHz) noise in the output. 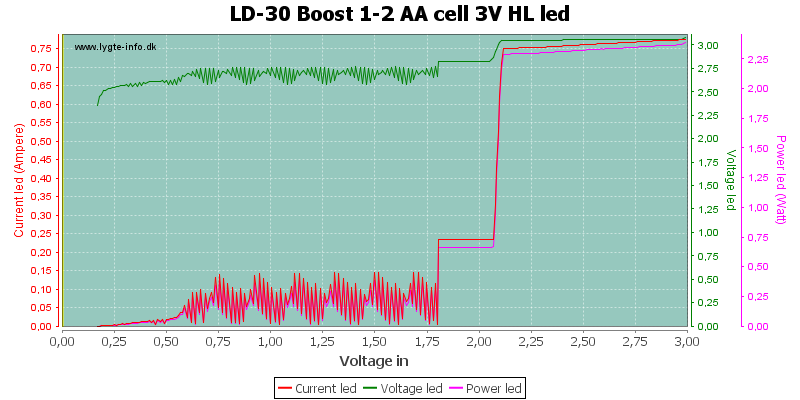 The low battery warning is slow flashing. 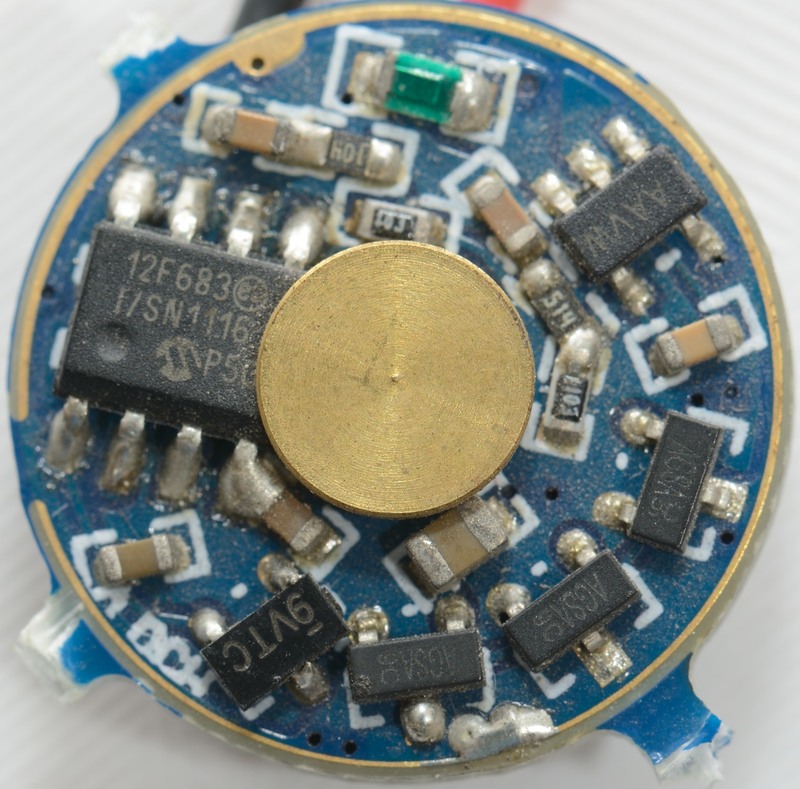 Medium uses a lower current and has the same low voltage limit. 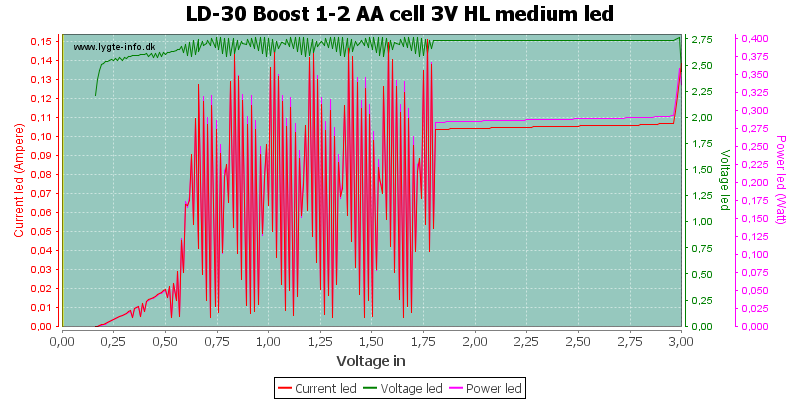 Single cell operation uses same brightness as two cell operation on medium. There is less high frequency noise in the output at medium. 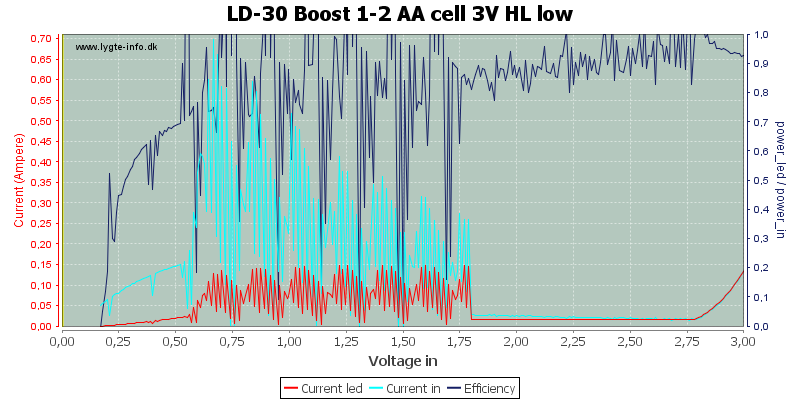 Low is using a very low current (Meter says 16mA) and due to noise my efficiency calculations are a bit jumpy. 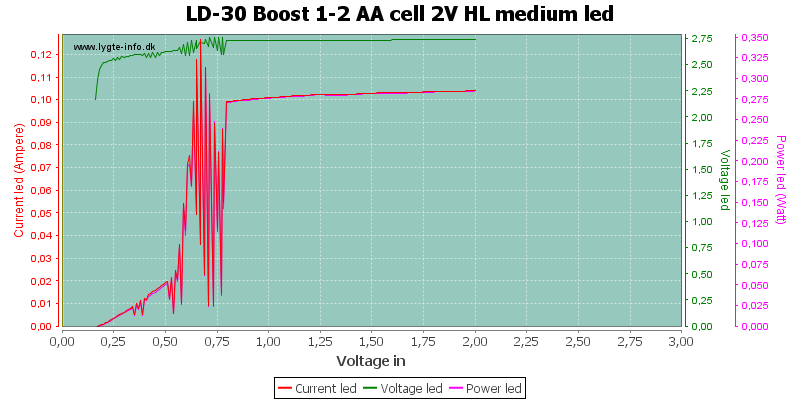 The current increase at 2.75 volt is the driver going into direct drive, because the voltage is above the led Vf. 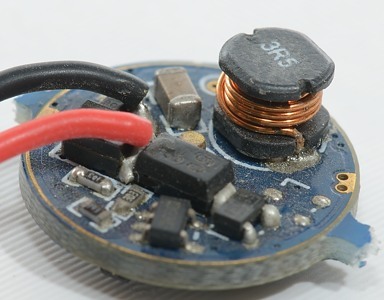 This is not dangerous, but means that the low mode will not work with fresh alkaline batteries or lithium batteries. 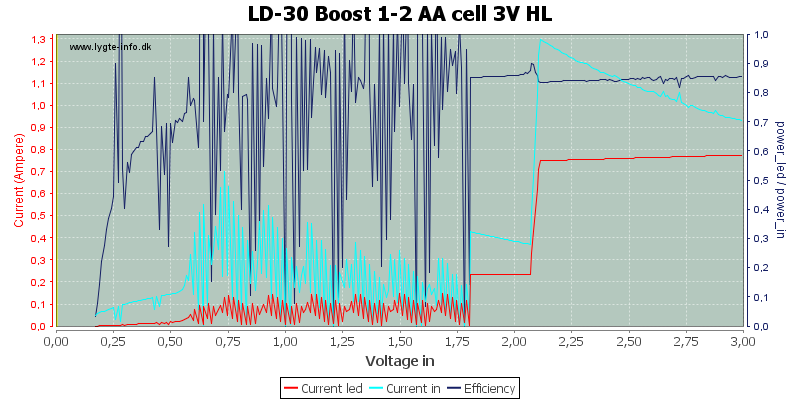 The low battery indication will increase current consumption in low mode. 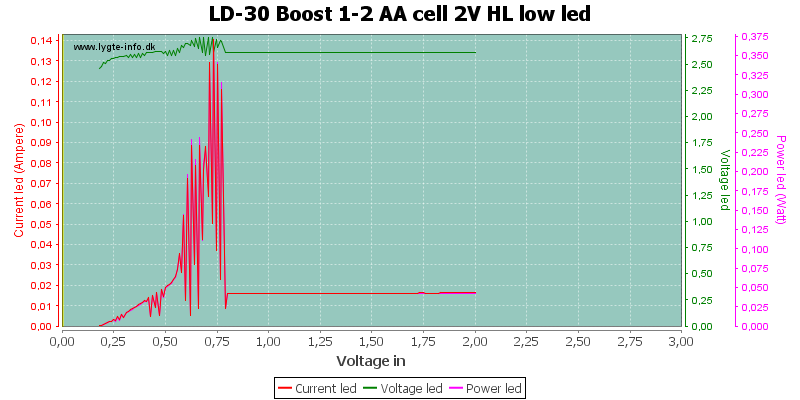 In single cell mode the led current is also 16mA. 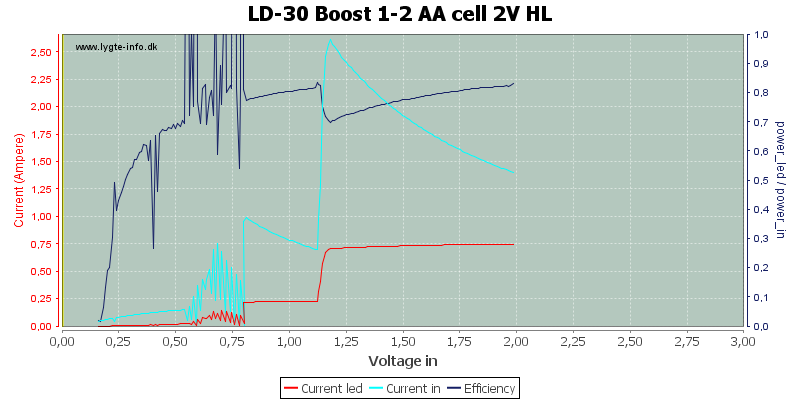 At this current the output for two cells is small flashes at a high frequency, for one cell the output is smooth. 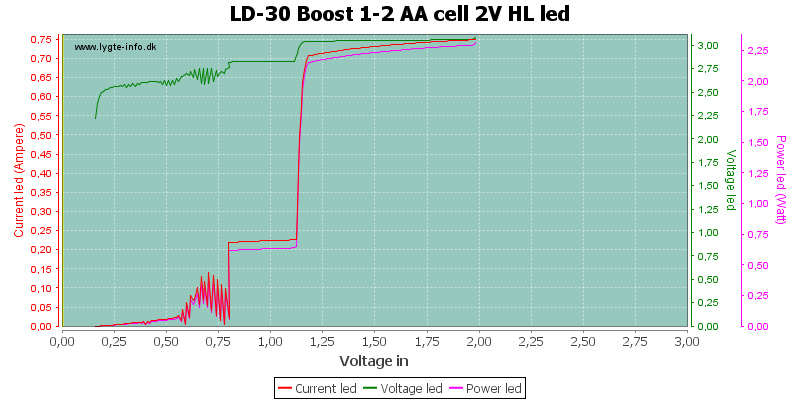 The brightness of strobe depends on the number of batteries, two batteries are brighter than one. The frequency is the same. 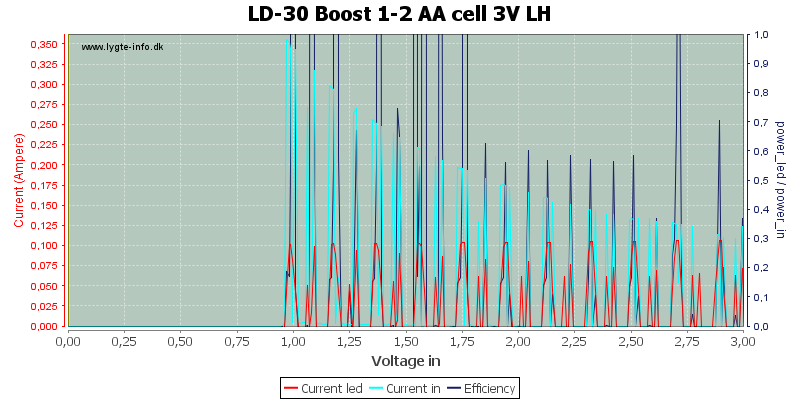 SOS uses same brightness for both single and dual cell configuration. 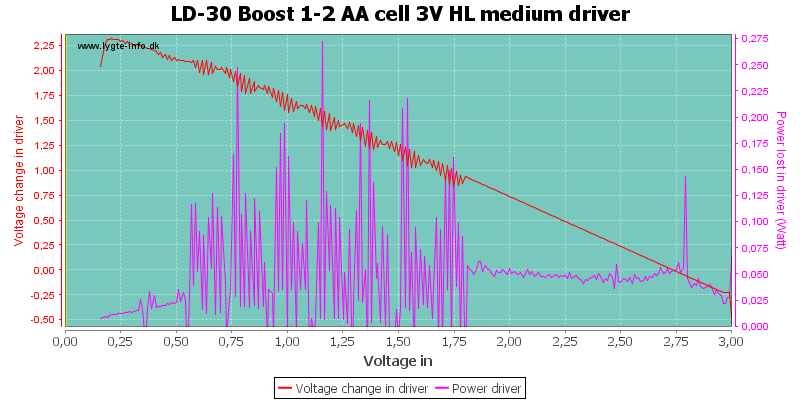 This driver is a good driver for one or two batteries, it has a good efficiency and low loss in driver (Except on high with one cell). 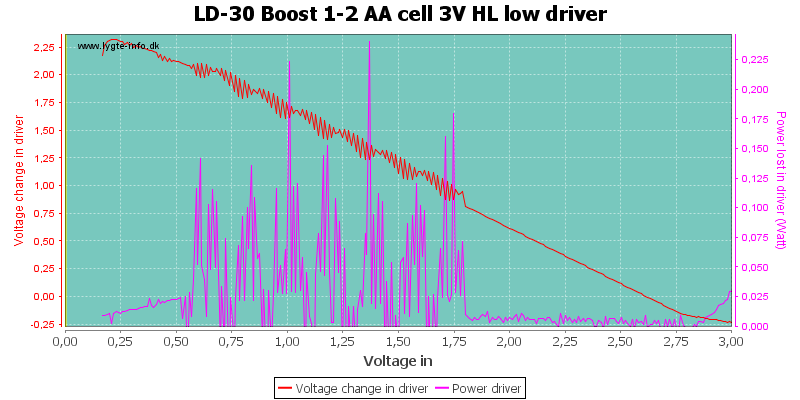 Only "problem" is loss at low mode in some circumstances and not all people like a 5 mode driver.